I am delighted to share with you the NSW Government’s landmark funding announcement made today, committing $244 million to the expansion of the Art Gallery of New South Wales. This funding is the single biggest show of support by the NSW Government for a major cultural infrastructure project in NSW. The Government’s funding, coupled with $70 million already pledged by our private benefactors as part of our $100 million capital campaign, will transform our much-loved and historic Gallery into one of the world’s great art museums and bring to life the remarkable designs of globally renowned architects SANAA. 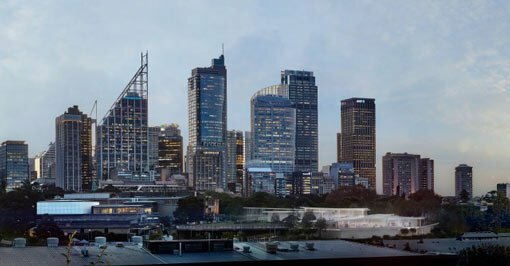 In-progress image: Sydney Modern Project, dusk view from Woolloomooloo, as produced by Kazuyo Sejima + Ryue Nishizawa / SANAA. This is a very special day for the Gallery, the arts community and everyone across NSW. This funding marks the most significant expansion of the Gallery to date and will deliver for the State substantial cultural, social, environmental and economic benefits. Since 1871, the Gallery has been Sydney’s great meeting place where people from across the city, NSW, Australia and the world have come together to enjoy art and culture. The Gallery’s expansion will deliver a new creative precinct in Sydney that aims to double visitation to two million per year, and double school student visits to 200,000 per year. We will also create innovative and enhanced spaces and facilities with interactive experiences for all visitors, including state-of-the-art digital activities, online programs and new art forms, delivering more opportunities to interact, engage and participate in art and culture both at the Gallery and remotely. Most importantly, by expanding the Gallery we will have more space to be able to display more of the State’s $1.3 billion art collection, especially the large, iconic works that we currently don’t have the space to share with our visitors. Aboriginal and Torres Strait Islander art will be front and centre in the expanded Gallery, showcased and celebrated with the prominence it deserves. We will also be in a much stronger position to host some of the world’s great art exhibitions that we haven’t been able to attract to NSW due to our space constraints. An expanded Gallery gives us the means to share more art with the people of NSW, and our interstate and international visitors. The Sydney Modern Project will build on the Gallery’s long history of artistic innovation and leadership, by boldly celebrating world-renowned Australian and international art, from our vantage point in Australia’s global city and within the Asia Pacific region. Through the connection of art, architecture and landscape the new building will create experiential and responsive art experiences that will be in dialogue with reflective art histories presented in the Gallery’s existing building. Together, the two buildings will create a compelling and inspiring exploration of art and culture. The expansion will generate wider economic benefit to the NSW economy of over $1 billion over the next 25 years and create up to 242 full-time jobs in NSW. It is also set to become an unsurpassed public-private partnership in the Australian arts. In addition to the $70 million in private funding pledged to date, a capital campaign to be formally launched later in the year aims to attract a total $100 million in philanthropic support towards the estimated $344 million project cost. We will continue to work with SANAA to evolve the initial competition-winning design concept until the planned submission of a State Significant Development Application in the coming months. There will be a number of opportunities for you to provide us with your feedback about the evolved design concept and to learn more about the project. I thank the NSW Government and our private benefactors for their generous support of the Sydney Modern Project and I thank you for your interest to date. I am thrilled to be sharing today’s exciting funding announcement with you, which signals a remarkable milestone in realising the much-anticipated expansion of the Art Gallery of New South Wales.